Excellent combination of fine details and sturdy, solid construction. Just with some brown/rust primer and some basic "rust effects," the pieces already looked ready for tabletop use, but the many little features in each "scrap pile" reward further detail work. I love how each piece has a slightly different "theme" and tells a different "story" in a way. 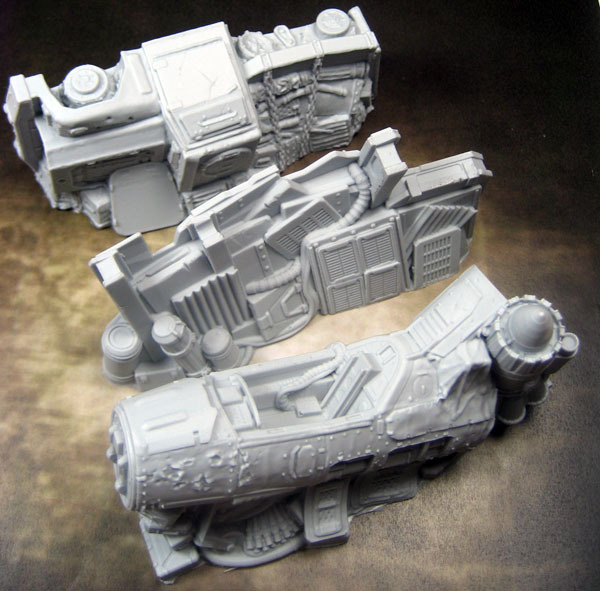 These could be used together as a simple barricade that fits nicely with Tablescapes (especially "Scrap Yard" or "Urban Street" themes), or as stand-alone scenery pieces (the cockpit & engine as decor for a scavenger's workshop, or the half-track as a simple upturned wreck). The "scrap wall" in particular has a lot to play around with, as the individual scrap panels could be painted in a number of ways so that copies of this piece will look varied on the table. Very fun to paint up, and I look forward to using these pieces for post-apocalyptic minis skirmishes.